One thing I admire about the Duchess of Cambridge (Princess Kate) is her flawless style. As a business woman, I know it's hard to look both elegant, classy, stylish and sophisticated all at once. Somehow Kate pulls it off, and -- hopefully -- I do at times at well. Today, Kate (I can't call her anything else!) and her new husband met with President and Mrs. Obama at Buckingham Palace. I love Kate's dress, so --of course -- I had to find out more about it. 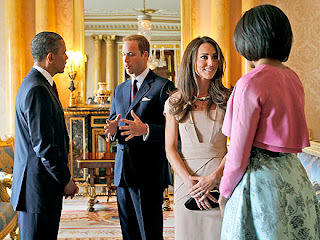 Kate is wearing the REISS Shola Bandage Dress, which is available in beige (seen above on Kate) and marine blue. It retails for about $340, but it's already selling out fast. I was not familiar with this brand until Kate wore a REISS white dress for the couple's engagement photo session. It's not surprising, though, since it's primarily available in the UK only. You have to give Kate props for supporting her country's designers.